Feel as good as your shave looks with refreshing Shutran™ Aftershave Lotion. Our 100 percent plant-based aftershave soothes, freshens, and calms skin after you’ve roughed up your skin shaving. Made with Shutran™ essential oil blend, organic coconut oil, argan oil, jojoba oil, witch hazel extract, dandelion root extract, and aloe vera, this aftershave won’t dry out your skin and is perfectly moisturising. Plus, application is a breeze! Shutran Aftershave Lotion isn’t greasy and absorbs quickly into skin, providing a light cooling sensation as it restores moisture. It’s the perfect shaving companion to our Shutran™ Shave Cream. Shutran Aftershave Lotion offers a little piece of feel-good luxury to the final step of your routine, since the vegan-friendly formula was made without parabens, EDTA, phthalates, petrochemicals, animal-derived ingredients, synthetic fragrances, or artificial colourants. 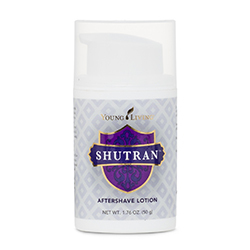 Apply a small amount to face after shaving with Young Living’s Shutran Shave Cream. Can also be applied between shaves to keep skin moisturised.